Professors from NC State's Department of Nuclear Engineering gave a symposium yesterday on the events at Fukushima, including an analysis of what happened and potential health consequences, as well as a Q&A from the audience. The entire symposium is now available for public viewing (no login required). The University of Wisconsin-Madison gave a similar forum, which is also available online. MIT's Department of Nuclear Engineering also gave a forum available on the web, although this was earlier in the timeline (and thus the information is likely less up-to-date). Each of these presentations was designed to engage and inform the general public about the events which have occurred at Fukushima, including a specific explanation of what we understand to have happened so far from the perspective of experts and ultimately what is being done now to bring the situation under control. The advantage of these types of seminars is that the offer the ability to convey more detailed explanations of the specific sequences of events that lead to the current situation which are typically not available in traditional media accounts. This is a quick post to summarize the newest and best things on the new I have my hands on to assess the state of the dispersion of radioactive gases from Fukushima I.
Firstly, a great new blog called Where are the Clouds? They are doing a fantastic job of following the new developments and actively contributing to the body of knowledge regarding dose rate readings and atmospheric plume modeling in the wake of the disaster. These are the professionals. A fantastic new graphic has appeared showing the plant site dose readings from the start through the "hottest" (radiological) days at the site. You can probably read this graph for half an hour. Credit to R.C. Hoetzlein, and many thanks for releasing it for all uses. There are still a few issues related to the units and comparisons, but otherwise amazing. I imagine it's hard for reporting offices to navigate the incredibly disjointed press releases coming from Tepco. A few days ago, they were in the main list of press releases on their home page. But then they moved it to a new page of releases of nothing but monitor readings specific to the plant. I had been coming back to the NYTimes graph for what the site readings are now giving, but it seems they stopped right about the time Tepco moved the page. Maybe they never got the memo. Or maybe they became bored of it. The most recent graph I see now is still a few days old, but as I've looked at the reports, not much has changed. On top of that, Tepco has released local area data that the NYTimes has graphed fairly well (this covers a lot of Fukushima Prefecture). Additionally, Tepco has updated this information over time, which gives a little bit more interesting picture than the confusing site readings. Of course, there is still bad information out there. The NYTimes published a map supposedly showing the dose rates at different radii from the plant, which would seem to any ordinary reader to predict nausea, vomiting, and hair loss at 5 miles away from the plant. The only problem is that it was made with no information specific to Fukushima I, aside from an assumption that fuel was failed, core melt occurred, containment was breached, etc. It's hard to identify just how wrong this graph is, because it doesn't even give enough information to know (i mean, exposure time). Thankfully, other bloggers have been identifying this as a misuse of a model from an old and otherwise well-intentioned paper. And anyway, to get an idea of what doses people in Japan are facing, you can just keep reading. What is Happening to Dose Rates in Japan? Note, in order to convert to Japan time right now, switch am and pm, then add 1 hour. To convert back to EST, switch am/pm and subtract an hour. There have been 2 major onsets of radiation spread over areas to the southwest of the Fukushima Daiichi plant. The first was very early on Tuesday 3/15 (Japan time). I've gone back and plotted the dose rates in Ibaraki Prefecture monitoring stations to compliment the previous graph I posted. Note that this is in log scale now. Ibaraki Prefecture is much closer to Fukushima than Tokyo and correspondingly has much higher dose rates, and yes, will have greater long term effects as well. Fukushima Prefecture, of course, is hit harder than any other. Let's return to Tokyo. How have things changed there? A second wave of artificial radiation has clearly appeared. The following shows the dose rates as the first and second major Southwest winds pushed the plume over the Tokyo area. One can easily identify the two transit dates the plume made through Tokyo. One is 3/15 in the morning and another is 3/21 in the morning. 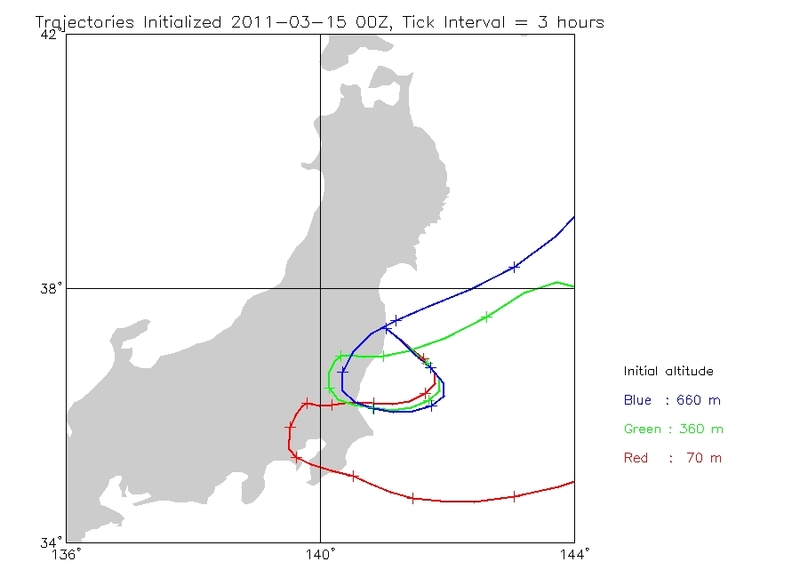 For 3/15, atmospheric data shows a line going straight through the Tokyo area, which is expected. If that wasn't enough evidence for you, the wind patterns at all altitudes on 3/21 and 3/22 show the plume traveling toward Tokyo and even further. Last post I was praising the public data feed from Japan's national network of detectors. The US, of course, has some impressive technology itself, and the DOE has come out with this bombshell (download in pptx format). The tool is called the Aerial Monitoring System, and obviously they send a plane around that constantly takes readings and quickly flies back and fourth over an area to get an incredible map of dose readings. These images are showing a local perspective (left) and larger perspective (right). You can see the path the craft takes in the lines that are shown. They show units of mR/hr. For many kinds of radiation, 1 R= 1 rad = 1 rem. 1 rem = 0.01 Sv, and the limit for radiation workers in the US is mSv, or 5 rem (equivalent dose). The red color in the graphs indicates 12.5 mR/hr, and if this was absorbed for a day, that would be 0.3 R, and the equivalent dose (adding extra weighting for more damaging particles) would be some amount more than that. Without getting into specifics, a 12.5 mR/hr area should really be avoided to whatever extent possible, but there should be differences between the readings from the air and the dose on the ground. Either way, the most important thing to avoid is internal dose. There is no reason to panic. The Japanese authorities have been making decisions to tell people not to eat certain farm products among other measures, these are all reasonable as far as I can tell but firmly based on the precautionary principle. Several professors from NC State's nuclear engineering department will be discussing the events at Fukushima Daiichi at a public forum this Wednesday; the event will also be live streamed. See below for details. What: Nuclear engineering experts at North Carolina State University will offer insight and analysis during a symposium on the recent events at the Fukushima Daiichi nuclear power plant in Japan. The plant was damaged during the March 11 earthquake and subsequent tsunami resulting in nuclear fuel damage and the release of radioactive material. Media coverage is invited. Who: A panel of four NC State nuclear engineering faculty members who have been closely following the events in Japan — Drs. John Gilligan, Michael Doster, Paul Turinsky and Man-Sung Yim — will discuss technical issues related to the damage to the plant, as well as challenges officials face as they try to contain the radioactive material. Audience members will have the opportunity to ask questions during the event. When: 5 p.m. on Wednesday, March 23. Live stream also available for public viewing of the symposium (no login required). Where: Park Shops, Room 130, at 101 Current Drive on NC State’s North Campus (map). Parking is available in the Cates Avenue (Coliseum) Parking Deck at 201 Jeter Drive on Central Campus (map). From the deck, visitors should walk north through the tunnel under the railroad tracks to reach North Campus and Park Shops. Current reports from TEPCO and NISA indicate that workers have restored off-site power at Units 1 and 2, with plans to restore off-site power to Units 3 and 4 tomorrow (March 21). This is a welcome development, indicating that the situation at the reactors is likely stabilizing. With the restoration of off-site power, cooling pumps can begin to circulate coolant in the reactors and spent fuel cooling pools once more, largely eliminating any further risk of fuel overheating and subsequent inadvertent release of radioactive materials. In addition, holes have been bored into the roofs of Units 5 and 6 as a preventative measure to vent any potential hydrogen buildup as to prevent further explosions of the kind that damaged Units 1 and 3. As off-site power is restored and the radiological levels decline, the damage can be more fully assessed and cleanup work can begin. Meanwhile, news reports from Japan indicate that through the use of infrared sensors, the surface temperatures at each of the reactors have been verified to be well below 100 C (i.e., the boiling point of water), meaning that water is present at each of the reactor units. It would thus appear that the efforts of workers to restore water to the spent fuel pools and reactors has been successful. XKCD recently posted a very interesting diagram putting the radiation levels observed in perspective - it's a very useful diagram for directly comparing some of the levels being discussed with levels encountered in everyday settings. This presentation by UCSB physics professor Benjamin Monreal also gives an excellent and concise summary of the likely radiological release consequences of Fukushima as well as past historical incidents (such as Three Mile Island and Chernobyl). Now that the situation with the reactors has appeared to have calmed down, much of the media focus now has shifted to reports of radioactive contamination of milk and spinach from areas near the plants. It should be emphasized that the levels of radioactivity found, while above regulatory limits, do not pose any immediate threat to human health. I will be posting a longer discussion of how radiological contaminaiton gets into the environement (and what we mean by "radiological contamination"), but in the meantime, it is useful to summarize what is going on in this case and the chief areas of concern. Given the nature of the radioactive release, most the released products fall into the categories of a) Radioactive noble gases (such as krypton, xenon, etc.) and b) Radioactive, chemically active gases such as iodine-131, c) Radioactive isotopes of cesium and strontium. Noble gases are of little concern, as they do not generally interact with the biosphere (i.e., they don't "stick" to anything, given that they are chemically inert). As a result, these gases will generally travel further into the atmosphere, becoming increasingly diluted (and thus of little concern for human health). Iodine-131 decays into Xenon-131, which is stable. Thus, after 8 days, the radiological contamination due to iodine will decrease by approximately half. By three weeks' time, this level will have dropped to an eighth of the original level; by three months' time, the radioactivity from iodine will have virtually disappeared. Other radioisotopes of concern are strontium-90 and cesium-137, which have half-lives of about 29 and 30 years, respectively. (These two isotopes are incidentally of concern from a waste management perspective, as the heat generated by this pair is a working constraint on repository capacity over the first hundred years.) Because the half-lives of these species are longer, their contributions to dose tends to be extremely small (much of what is ingested would be released by the body before it would decay). Strontium, being of the same element family as calcium, tends to chemically act like calcium in that it is accumulated in the bones; however, the dose levels from strontium would be quite small (far lower than that from natural sources). Many have pointed to the iodine contamination in the environment (particularly in milk) following Chernobyl as a reason for concern from Fukushima, however the levels of contamination from Chernobyl were far, far greater than those from Fukushima. Unlike Chernobyl, comparatively little radioactive material escaped the reactor, nor was this material lofted high into the air through fires like those found in Chernobyl. As a result, the levels of contamination are far smaller and the effects far more localized. Evidence of this is found in the relative dose estimates based upon monitoring stations around Japan and the plant itself; doses at the plant boundary have been around a few millirem per hour and dropping (particularly as coolant has been restored to spent fuel pools); levels are far lower than this farther away from the plant. Beyond reconstruction of the heavily damaged area (both from the earthquake and tsunami), one of the major challenges appears to be in overcoming the stigma of radiological contamination, despite the extremely low levels present (particularly after a few weeks). While any actual long-term health risk from radioactive contamination will be quite minimal after a few weeks (with no immediate-term risk at all), overcoming the stigma of radioactive contamination will take some time. In particular, one of the most pressing challenges will be to further educate the public about both comparative levels of radiation found in nature and the (relative lack of) increased risk from low levels of additional radioactivity. Update: Alan asked about the nature of emissions from these isotopes of concern and what their subsequent "weighting" factors would be. Cs, Sr, and I are all beta emitters; Cs-137 decays into Ba-137, which has a short-half life and gives off a gamma as it decays. Given this, the weighting factors for each is "1" - so in other words, the conversion from gray/rad is the same value in sievert/rem. This of course is not a comprehensive list (the list is found on page 33 of the above-linked document), however it covers the radioisotopes of concern here. CNN is reporting measurements of 965 Bq/kg in tap water in a village in Fukushima prefecture (where the Fukushima Daiichi plants are), compared to a national regulatory limit of 300 Bq/kg. As a result, authorities are advising residents to avoid drinking tap water for the time being. Again, however, knowing the half-life of I-131 allows us to know when these levels will fall to the safe (conservative) limits; in this case, in about two weeks for an areas closest to the contamination source. While certainly undesirable, in this time frame there are likely other problems with tap water as well beyond radiation, including contamination from biological pathogens, particularly given the tsunami. Right now, people are buying up packets of potassium iodine tablets in a panic, bidding the price up from $10 per pack to around $540. The worst part of all of this is that many of these people are in places far away from Japan, including places such as Russia, British Columbia, and California. There is nothing more counterproductive in a situation like this than blind panic, particularly when it's carried out by those at no risk whatsoever. (I'm looking at you, California.) In particular, the real danger here in these kinds of panic buys is in depriving those who may actually need them the most. The CDC has correctly emphasized that people in the United States should not be taking potassium iodine in response to the events at Fukushima. Of course, this kind of hysteria is not an unknown - one need only go back to the mass panic purchases of Cipro shortly after the highly publicized anthrax letters in 2001 to find a recent example. Nuclear Fissionary points to a hoax fallout map which has been making its rounds around the internet, stoking these very fears. Note that the radiation levels at the nearest measuring point of Ibaraki prefecture (100 miles from Fukushima) are merely elevated (i.e., detectable above natural background) - as in, there is no serious danger (levels are around 0.01-0.02 millirad per hour - in other words, quite low.) At this point, it is unlikely that any significant changes from background levels can even be measured outside of Japan. President Obama emphasized in his speech yesterday, "The Center for Disease Control does not recommend that people in the U.S. take any precautions other than being fully informed." This is the correct response. However, one issue which has muddled the overall measured tone of the administration's response has been the directive for U.S. citizens within 50 miles (80 km) of Fukushima to evacuate - for comparison, the official evacuation zone imposed by the Japanese has been 12 km, with residents within 20 km advised to stay indoors with their windows closed. Rod Adams at Atomic Insights has been sharply critical of this move, and I think some of the rationale bears repeating. Right now, there is an intense humanitarian crisis going on, brought about by a record earthquake and devastating tsunami. For these people - estimates put the number displaced around 380,000, finding food, clean water, and shelter from the elements where the temperatures have reached below freezing is the highest priority. Any evacuation should be weighed against the risks of displacing yet more people in a disaster area, much less the exposures created by forcing them out of their homes (where reasonable measures can be taken to protect against elevated radiation exposure, such as sealing doors and windows). While it is my personal opinion that an evacuation of those closest to the plant was likely reasonable balanced against the risks (despite the fact that the radiation levels pose no immediate threats to human health at the plant boundary), advocating for an increase in the evacuation zone to four times the level that the Japanese government has set out (all while in the middle of a record natural disaster) seems downright irresponsible. The response of the administration and the NRC is that this radius would be standard procedure in the United States for a similar situation; however, it is extremely questionable as to the additional benefit of evacuating such a large additional number of people, particularly weighed against the additional exposure and other risks that such a larger evacuation entails. For those curious, ANS has a special interactive page where one can see what their annual dose is from a variety of natural and synthetic sources (particularly from common medical procedures). This can help put the radiation levels being discussed in context. NISA has also posted an English version of the latest radiation readings outside of the 20 km zone around Fukushima. For reference, 1 microsievert = 0.1 millirem (or, conversely, 1 millirem = 10 microsievert). The document also helpfully notes that the current measured average in Tokyo right now is about 0.05 microsievert/hour = 438 microsievert/year, or about 44 millirem/year. (Average exposure from everyday sources for individuals typically ranges in 400-600 millirem/year). Meanwhile, the best advice for situations such as this was offered by Douglas Adams in "The Hitchhiker's Guide to the Galaxy": Don't Panic. In order to cool spent fuel pool of Unit 3 we conducted water spray by helicopters of Self-Defense Force at approximately 9:48 am. We are continuously monitoring the spent fuel pool and plan to conduct water spray to other Units. This appears to be the only "updated" information from TEPCO at the moment - the rest of the press release was identical to prior releases. This is consistent with reported information from yesterday. 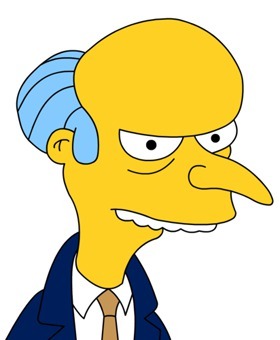 No reports from TEPCO concerning the spent fuel pool at Unit 4. Seawater is being injected as of 04:00 March 17th. Emergency Diesel Generator (1 unit) for Unit 6 is operable and supplying electricity to Units 5 and 6. Water injection to the Spent Fuel Pool through MUWC is progressing. It is scheduled to inject water to RPV after the recovery of external power source. In a welcome development, NEI and NISA also report that technicians are laying electrical lines to connect Unit 2 to offsite power, meaning that cooling pumps could be turned back on, preventing any further fuel damage from overheating and allowing workers to focus on other units. JAIF reports three operations were attempted to deliver water to the spent fuel pools at Unit 3. One operation involved four "bucket drops" from a helicopter with a lead-lined bottom (and workers in radiation suits). In a second attempt, the National Police agency attempted to spray water from the ground, however the spent fuel pool is at the top of the reactor building, and they were unable to get close enough to do so due to elevated radiation levels. In a third attempt, special pump trucks have been brought in with water cannons (which do not require personnel to leave the truck) and have been reported to have delivered 30 tons of water to the building. Whether this has been effective will be evaluated. It is unclear at this point what the status of the water levels in the spent fuel cooling pools at Units 3 and 4 are; the latest from JAIF indicates water levels are a current concern for Units 3 and 4.. However, all current reports appear to indicate the focus has been on Unit 3, rather than Unit 4. World Nuclear News reports that Japanese officials have made assurances that some water has been still observed in spent fuel pools during helicopter drops at Unit 4. NEI also reports that the site boundary readings at the Fukushima Daiichi plant were reading around 2 to 3 millirems per hour. This level is still elevated, but relatively low. Radiation exposure rates at the plant themselves are higher; World Nuclear News has reported them to be around a peak of 400 millisieverts per hour at Unit 3 (inland) and 100 millisieverts per hour at Unit 4 (inland) - this corresponds to a dose rate of around 40 and 10 rem per hour. These are high exposure rates (where acute effects begin to become a concern after prolonged exposures), severely limiting workers' access to peak exposure areas. Readings from monitoring sites using the SPEEDI tool Alan linked to indicate radiation levels at Ibaraki prefecture (the closest currently operational monitoring site) show levels on the range of 100-200 nGy/hr (about 0.01-0.02 millirad/hr) and are steadily dropping, with no recent peaks appearing in the last 24 hours. These levels are very low and appear to be a good sign. One of the big issues for those following the news right now has been the status of the spent fuel cooling ponds at Fukushima Daiichi Unit 4. Unit 4 was undergoing regular maintenance prior to the earthquake; no fuel was in the reactor. Thus, until now it has not been as serious of a concern as Units 1, 2, and 3. Reports from the Japan Industrial Atomic Forum (JAIF) indicate low water levels at the spent fuel pool, with damage suspected to the fuel rods. An explosion and fire have also been reported at Unit 4. While some suspect the explosion may have been hydrogen-related, the spent fuel pool was significantly cooler than the reactors at Units 1 and 3, with temperatures reported to be around 85 C (185 F) over the past two days - thus, the explosion remains difficult to understand. Several fires have also broken out over the last two days in the spent fuel storage area - sources indicate that these have been machinery oil fires, which have since been contained. Reports of low water levels at the Unit 4 spent fuel storage pool appear to have begun at least 24 hours ago (as of 19:00 hours on March 15). It is difficult to determine the current status of the fuel pool, given conflicting accounts. U.S. NRC chairman Gregory Jazcko has indicated that it is his staff's belief that, "there is no water in the spent fuel pool." This was immediately contradicted by a TEPCO spokesperson who indicated "the condition is stable", however no further updates are available at the TEPCO website. However, water levels at the spent fuel pools have been a reported concern for some time, according to both World Nuclear News and NEI. CNN and NHK are currently reporting that JSDF helicopters are currently attempting to drop water onto the Unit 4 building in order to add coolant, as well as water cannons (essentially, fire engines) on standby. Unlike the fuel immediately after shutdown like in Units 1 and 3, spent fuel sitting in the cooling pool is considerably cooler, although it still generates enough heat to require water cooling. Spent fuel is generally about 10-13 feet in height; the water covering this fuel is generally at least another 20 feet in height above the fuel itself. This water serves a dual purpose - it both keeps the fuel cool and provides a good measure of radiological shielding; exposure rates immediately above the spent fuel pool are such that workers can generally be in the area without special protective equipment - generally less than 2 millirem per hour (about a fifth of the dose of a chest x-ray). The spent fuel storage pool is kept at atmospheric pressure, unlike the reactor. Under normal conditions, pumps will circulate cooling water in order to keep the rods cool, although under emergency conditions, natural circulation is expected to take over (i.e., where warmer water expands and grows less dense, thus rising to the top, while cool water, which is denser, sinks - thus providing a natural "circulation" for heat removal around the rod.) These spent fuel pools tend to be quite robust - a simple failure of pumps or piping would not be able to drain the water level from these pools, which are made of thick concrete and steel. Generally, the only way significant water level changes could be expected in the spent fuel pool are from evaporation of the water or if a large crack were to develop in the pool itself. Readings over the last two days indicate that the temperatures of the pools were elevated, at around 85 C (185 F) - while certainly warm, well below boiling. (However, one can expect an increased rate of evaporation at this temperature). The IAEA confirms these temperatures for the prior two days, however no data was available for today. If accounts of diminished water levels are to be believed, this would imply that there may be structural damage to the building; this much is unknown at this time. Reports indicate that there may be fuel damage due to dropping water levels - this would likely be in the form of cladding failures, which have released radioactive fission gases similar to the process in Units 1, 2, and 3. The major concern for workers right now is in personal safety - without the protective layer of water, there is significantly less radiological shielding, making it far more difficult to operate around the spent fuel pool. This would appear to be the reason for using water cannons and helicopter drops in order to supply emergency water, in order to bring radiation levels back down (by providing an adequate layer of water for shielding). For those keeping score at home, the radiological source from these spent fuel rods would be deep-penetrating gamma radiation; the danger to workers is that the exposed would be that in the absence of the several feet of water shielding, the spent fuel rods would essentially act as a "gamma flashlight" pointing out of the fuel pool. Depending upon the age of the fuel rods themselves (which determines the level of decay heat), it seems less likely that any kind of actual fuel melting would occur itself. Rather, the chief issue appears to be in the radiological release from ruptured fuel cladding as well as the higher levels of radioactivity, which make it extremely difficult for workers to get close to the pool in order to refill it with coolant - hence the use of helicopters and water cannons from the ground. I will continue to update as I learn more - unfortunately, the news on this appears to be very scarce, and mixed at best. Update: JAIF confirms helicopters dropping seawater on Units 3 and 4 due to low coolant levels. Private sources have also begun to confirm that water levels are very low at Unit 4. They also have an English version, but it lacks all the cool tools. They have 16 different reporting sites, typically with about a dozen different monitoring locations each. Not surprisingly, these are almost entirely associated with nuclear power plants, nuclear research facilities (such as associated with the JAEA), and educational institutions. There locations are currently not reporting, including the Fukushima I plant itself. If you are looking for data, graphs, and resources for that, well I am too. Here is what I have so far. I would not be surprised if there are better illustrations by the time I post this, but this is what I know of. Back to the national radiation readings. Much of the concern so far has referenced Tokyo. Not that other areas equally far from the plant are not also subject to the same elevated dose, but Tokyo has one of the largest metropolitan areas in the world. A small effect over a large number of people can be very significant. We have no readings for Tokyo, but we do have some in Kanagawa Prefecture (thank you GNF), which is right next to it. You can also get 7-day graphs of dose. But each monitoring station is different and there are 12 of them in Kanagawa Prefecture, and it turns out that matters a great deal to both the background dose and the profile of the elevated radiation levels. I apologize for the quality, but here is my mashup. Regarding the chart, most detectors were not operational right after the earthquake, which I find completely understandable. The area was then unaffected until early on the 15th. After that, clearly elevated radiation levels occurred and have been sustained. Yes, it's not dangerous, but we're talking about Kangawa Prefecture, which is 157 miles away from the plant. Other locations, closer by are getting much more. Just have a look at Ibaraki, the 5th in the list here, although you would probably have figured that out on your own since it's 10x the dose rate of all the others right now. So, I've answered many of my own questions and hopefully this answers the same for you. Even though this is the case, I still believe it to be unhelpful and sensationalist for a news organization to go announce simply "radiation levels in Tokyo 20 times normal", for several reasons, not least of which because it's cherry picked. A spike in levels is just that, a spike, and after those spikes the area is experiencing close to twice background. Q: Has the Tokyo area been exposed to significant radiation compared to natural, directly from the plant? It is not to the people in Tokyo. This enters into the debate of the impact of low-level radiation. People in that area are not being exposed to more radiation than what they would probably get during a Mount Fuji hiking trip. However, other areas closer to the plant do need to be paying attention. I've started to come across some other official releases that have been translated into English. 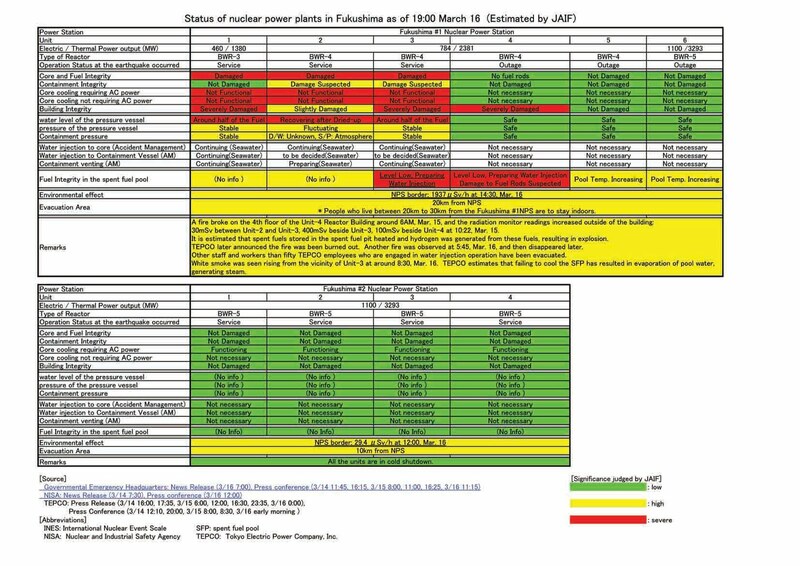 I will start with a data sheet outlining the most recent Fukushima plants status. It seems that the 'time' to start blaming is upon us. The Daiichi plants have suffered damage over the last few days and reports about where to start pointing fingers is now creeping into the recent news reports. I have witnessed quite a few already saying that there hasn't been enough information coming from official sources; that the government and the company are trying to downplay the situation. I am not in a position to talk about what events happened years ago but I am in a position to speak on what is happening now. In fact, it is one of the key reasons that I decided to really push any information out in some kind of medium. The events unfolding in Japan are hard to watch and as a nuclear engineer myself I find some small measure of peace explaining what I can to those who care to listen. The official sources of information are out there. There are enough of them giving updates day in and day out that it's all I can do to try and keep up. Between the three of us, we've found detailed information on the plant status, statements from high levels of Japanese government, our government, nuclear experts, the IAEA, NEI, ANS, NISA, JAIF, TEPCO, .... I mean come on! We now seem to be transitioning into the next stage where those who have been 'reporting' are now looking how to prolong the story. The uber-hype is probably starting to fall on the deaf ears of the fickle ADHD public. With that being said, science is a slow, meticulous process that, for some, takes a frustratingly long time. Project time lines are on the order of years. Some spend entire careers chasing for the truth. A physics professor used a saying that, "The more you learn about less and less until you know everything about nothing". In a field like nuclear engineering I couldn't agree more. It's not that the nuclear engineers didn't do their homework. It's not that the Mark I containment isn't adequate to handle the stresses it was designed to handle. It's that, somehow, at some point in time, someone decided to demand that nuclear energy must operate in the world of absolutes. Is it absolutely safe? Can you guarantee that my child will receive absolutely no radiation dose? Are you absolutely sure? ...Really? This was something that was long established before I was introduced into the industry and I wonder, what will it take to change it? From the countless hours I have already spent researching the events and keeping up with what's happening over at Fukushima Daiichi I ask what more could people want? These sites are releasing bulletins by the handfuls every day. TEPCO has been releasing updates almost hourly. I guess some expect absolutes. They want to hear that there is no uncertainty; that it is or it isn't. I don't know what to say to this line of thinking other than, "Wake up!" because there are no absolutes. Science is as science does. Even if there are people to blame or victims to be compensated, none of this will even begin to actually be addressed until the situation at Fukushima is over. Even then, as scientists, we're going to take our thick-rimmed glasses and our pocket protectors and we're going to do our job. Science doesn't require emotion and even if you don't find yourself emotional about science then it's still not hard to understand that the extremely emotional broadcasts don't translate into good science. Familiar to grad students and regular readers of Jorge Cham's comic "Piled Higher and Deeper", but for those unfamiliar, it seems appropriate right now. There is some publicly available data that has been cropping up regarding the radiation readings around the Fukushima I nuclear plant. Putting my Excel and Japanese skills to work, I've been trying to analyze the information accompanying the Japanese press releases from TEPCO. Yes, they have a lot of the same information as the English press releases, but the Japanese releases also include information about the radiation monitors. These are called Monitoring Posts (MP, jp:モニタリングポスト) . One format they release this data in is a somewhat frustrating pdf file. I have hacked at this and am please to present some amount of visualization and interpretation for you here. But first, what's already on the internet? You can find some very techie work done by Japanese bloggers (or something like that), which is very good, but I could not get all that much out of. Adamu gives a good size up of the present state of radiation safety. One image shows a simple spike from 9-12am on 3-15 from the same source I'm using. The next image shows a spike from a GM (Geiger) counter streaming on the internet. If I understood correctly, this is showing real time data from Hino in Tokyo and a peak that may correlate with a major release from the plant. There is even a stream of a webcam watching the screen of a detector online that has also been getting covered by popular Japan blogging. The media has been shooting stories everywhere about the fact that radiation had been detected in Tokyo, and of course, all the panic that comes with it. I would suggest a skeptical eye in reading most information related to this, but hey, we are living in the digital age, and we should all be empowered to draw actual readings from open sources and compare to the events that are being reported on and judge for ourselves. So here's is my size up of the released numbers from TEPCO. I still have a lot of polishing to do, but since I haven't seen this detail anywhere else I'm rushing to get it out there. The first few are self-explanatory, the gate is most important, and the MPs refer to the monitoring posts. Within the report, many locations are denoted with 付近, meaning neighboring area. I mean, some readings were taken at a location, and others were just taken around that location, or at least that's how it appears to me. This is just one of the many things indicating inconsistencies in, or changing of, the method of taking the readings. Maybe we would expect this anyway, given the state the plant has been in. Of course, the monitors themselves will give counts per minute, and it's the job of a health physicist to convert to a dose measurement. The only reading that comes even close to keeping a good historical record is the plant gate, and this is surely of the most interest. Aside from that, the MPs are strewn around the perimeter of the site. This is simply my speculation, but it would make since no MP would be near a building and release point. I would also speculate that the spikes seen have to do with the intentional venting of steam. The quick uptick and slow decrease could make sense in that case. Otherwise, I will leave the task of correlating this behavior with actual reported plant events for later or for others. If anyone is interested a little more in the meaning of the radiation readings, consider that the exposure for the average person is 3.6 mSv/year, or 0.41 µSv/h. There are plenty of colorful graphs on the internet for perspective too. For those of us who don't mind Japanese sites, I recommend the example of the Kashiwazaki-Kariwa radiation monitoring webpage. In addition to having their data streaming, they provide fun cartoons showing the effect of snow and rain on radiation readings. I am sure this kind of explanation would be an absolute necessity for presenting the information to the public, since humans absolutely love to make up reasons that a graph is moving one way or the other. Currently, major media is reporting that a radiation spike has forced workers to suspend operation, which should be very interesting to see once I can get around to looking at the data. I will probably do more with this data soon, including pasting it all over Wikipedia. My main take away is that there was never just a radiation spike. There have been many spikes as well as a constantly increasing level, which looks a lot like a drawn out and continuous battle. Interestingly, I think that makes this accident very different from famous past nuclear accidents. ADDITION: Another blogger has pointed out the location of the Onagawa monitoring website. I find this very neat, and certainly very useful to the people of Japan right now. But note that this is a different company. Also see monitoring sites for the plants in the area: Fukushima II, Higashi-Doori, and Hamaoka. No guarantee that these sites will work, have up-to-date data, or even make sense. The disaster has far-reaching effects and all the nuclear sites are in various states. Here is the Fukushima real time data site, and the monitoring post feed, and guess what? It's not working anymore (I mean to say this should be expected). It does, however, give readings from 12/01 through 3/11, and this is useful for the current discussion. It gives a zoomed in graph showing readings being normal right up until 3/11, 14:40 (2:40pm), which I believe is, by no coincidence, about the strike time of the quake. First, let's talk about some cases where they get it right. William Saletan at Slate: Nuclear Overreactors. Saletan in a very welcome fashion throws a bit of cold water on the current hyperbole about the Japanese nuclear situation, especially given the current risks we tolerate from other sources of energy (particularly oil, although the same could be said for natural gas extraction as well). The New York Times has an excellent interactive feature explaining the mechanics involved with the Fukushima reactors in basic terms - it does a very nice job visualizing what's going on here. WNYC, a New York City NPR affiliate, had an interview with former GE VP for Engineering Quality at GE Nuclear Margaret Harding. Then, of course, there's the predictable reactions by those who don't really know much about what they're talking about. First, there's syndicated columnist Anne Applebaum, someone not normally given to fits of hyperbole, with this: If the Japanese can’t build a safe reactor, who can? Increasingly, nuclear power is also promoted because it safe. Which it is — except, of course, when it is not. Chances of a major disaster are tiny, one in a hundred million. But in the event of a statistically improbable major disaster, the damage could include, say, the destruction of a city or the poisoning of a country. The cost of such a potential catastrophe is partly reflected in the price of plant construction, and it partly explains the cost overruns in Finland: Nobody can risk the tiniest flaw in the concrete or the most minimal reduction in the quality of the steel. But as we are about to learn in Japan, the true costs of nuclear power are never reflected even in the very high price of plant construction. Inevitably, the enormous costs of nuclear waste disposal fall to taxpayers, not the nuclear industry. The costs of cleanup, even in the wake of a relatively small accident, are eventually borne by government, too. Health-care costs will also be paid by society at large, one way or another. If there is true nuclear catastrophe in Japan, the entire world will pay the price. A few problems, here. First, "the destruction of a city or the poisoning of a country?" A reminder that bears repeating: not one single person was killed due to Three Mile Island. None. And so far, the only person killed as a direct result of Japan's reactor accident has been a crane operator - and this was due to the earthquake, not the reactor itself. And why is that? Because nuclear engineers take the job of safety very, very seriously. Reactors are designed with multiple barriers against radioactive release in order to prevent these very dire consequences Applebaum refers to. Every reactor in operation right now in the United States and Japan has multiple systems to prevent radioactive release, unlike the Chernobyl system which undoubtedly Ms. Applebaum refers to. Furthermore, in the United States at least, the cost of waste disposal is not paid for by the government. Each utility pays a fee ($0.001 per kilowatt-hour of electricity generated) into a waste disposal fund, since the 1980s. This fund has accumulated over $30 billion - of which, only $10 billion has been spent on the (now-defunct) Yucca Mountain repository. One can argue that these costs are picked up by ratepayers, but certainly not taxpayers writ large. And as for health care costs? Look at the numbers for premature deaths due to every other energy source, particularly for coal, oil, and others. (Even "green" energy sources have their own costs, from toxic waste generated to manufacture semiconductors for solar cells to the environmental impacts to construct and operate wind turbines). The basic story here is simple: there is no "free lunch," and there is certainly no "risk free" form of energy. The best we can do is to weigh the relative risks and benefits appropriately. Ugh. There's nothing wrong with different points of view, but there is something positively despicable about exploiting tragedy in order to push a particular agenda. Tokyo Electric Power Co. said that an oil leak in a cooling water pump at Unit 4 was the cause of a fire that burned for approximately 140 minutes. The fire was not in the spent fuel pool, as reported by several media outlets. Unit 4 was in a 105-day-long maintenance outage at the time of the earthquake and there is no fuel in the reactor. Energy Secretary Steven Chu said today that nuclear energy is safe and important to the country's energy portfolio. Americans should have full confidence that the United States has rigorous safety regulations in place to ensure that our nuclear power is generated safely and responsibly. In testimony before the House of Representatives, Chu said: Safety remains at the forefront of our effort to responsibly develop America's energy resources, and we will continue to incorporate best practices and lessons learned into that process. He said the country must rely on several energy sources, including nuclear. Sen. Jeff Bingaman, chairman of the Energy and Natural Resources Committee, said in a statement, I think undoubtedly they'll (Nuclear Regulatory Commission) be taking a fresh look at the safety precautions and provisions that are in place, in light of whatever is learned from the Japanese. I hope that the Commission will quickly reach some conclusions about whether the safety precautions and provisions that it has insisted on are adequate for the future. The level of radioactivity at the Fukushima Daiichi nuclear power plant has been decreasing, according to the International Atomic Energy Agency. Units 1 and 3 at Fukushima Daiichi are stable and cooling is being maintained through seawater injection. Primary containment integrity has been maintained on both reactors. The Japan Atomic Energy Agency (JAEA) reported an explosion in the suppression pool at Fukushima Daiichi Unit 2, at 7:14 p.m. EDT on March 14. Reactor water level was reported to be at 2.7 meters below the top of the fuel. The pressure in the suppression pool decreased from 3 atmospheres to 1 atmosphere. Radiation readings at the site increased to 96 millirem per hour. Kitaibaraki (200 km south of site) 0.4 millirem/hr. We are working on getting updated information on radiation and dose rates at and near the plant. Safety relief valves were able to be re-opened and seawater injection into the reactor core was restarted around 1 a.m. EDT on March 15 and is continuing. All four reactors at Fukushima Daini are being maintained with normal cooling using residual heat removal systems. (Again, awesome). NEI is running continuous updates on the situation with the Fukushima reactors, however the goal here is to summarize everything that's been reported thus so far and what the general implications of these events are. Currently, the situation at Units 1 and 3 is stable - the reactors are under control and being cooled by seawater laced with boron. As indicated before, the addition of boron is a safety precaution to prevent any further fission in the fuel - boron "eats" any neutrons which may still be produced in the reactor through "spontaneous" fissions (from isotopes such as plutonium). The reactors are "off" and in "cold shutdown" mode now, so any fission chain reactions are no longer possible. Both Units 1 and 3 are reported to have lost coolant for some time, with fuel rods becoming partially uncovered for some time at both reactors. Air is a relatively inefficient conductor of heat, thus when rods are uncovered, this leads to a buildup of heat (due to the decay heat in the rods) in the fuel and cladding material. As a result, some damage may have occurred to the cladding or fuel itself. The measured presence of cesium and iodine outside of the reactor may have indicated damage to the zirconium cladding, allowing some escape of fission gases. Iodine and cesium, as well as noble gases such as xenon and krypton, are generally present as fission product gases. One of the purposes of the clad material, beyond providing mechanical support for fuel pellets, is in containing these fission product gases. As hydrogen built up in the secondary containment (the reactor support building above the reactor), this eventually ignited and exploded. However, in both cases the "primary" containment (composed of the steel reactor vessel and a thick concrete wall) appears to be undamaged. With the reactors now being safely cooled however, it would appear the worst is over from these units. Given that the fission reaction has stopped and decay heat decreases with time, as long as the reactors continue to be cooled, little further damage to the core for either of these units can be expected. Reports from TEPCO also indicate Unit 2 lost coolant for around 140 minutes following the damage, due to a rapid rise in pressure inside of the Unit 2 containment. This appears to have left the fuel rods uncovered for some time, possibly leading to damage to the clad or rods. This appears to have been the most prolonged period of the fuel remaining "uncovered" of the three reactors thus so far. As a result, radiation levels at the plant boundary was reported to have briefly spiked to around 1000 millirem per hour - six hours later, the level has declined to around 60 millirem per hour. While this level is elevated, these levels do not pose any immediate threat to human health. Given the discussion in the media, the question in the media has now inevitably turned to characterizing whether the events at Fukushima Daiichi constitute a "meltdown." "Oh, meltdown. It's one of those annoying buzzwords. We prefer to call it an unrequested fission surplus." Three of the reactors appear to have lost coolant for some period of time, possibly exposing the fuel rods. The fission reaction is "off" in all of the reactors - this happened as soon as the earthquake hit and the control rods were dropped into place. Currently, all of the heat being produced in the rods is due to decay heat. This heat decreases rapidly and exponentially with time. All three reactors (Units 1, 2, and 3) are being cooled by an injection of seawater containing boron. No fuel is currently exposed. So far, it is unknown whether there has been any actual melting of the fuel pellets themselves. Bear in mind that fuel pellets are designed to withstand incredibly high temperatures - the melting point is nearly 3000 degrees Celsius. The melting point of Zircaloy (the zirconium alloy used in fuel cladding) is around 1850 degrees Celsius. In situation where water covering the fuel rods is lost, particularly after a shutdown, the fuel is designed to withstand short periods without cooling. It is possible (and appears likely) in this case that there may have been some damage to the clad (having a lower melting point), thus allowing for the release of some fission product gases while the fuel itself has maintained its integrity. Thus so far, there is little evidence that the fuel itself has melted - likewise, for the entire core to melt would require that the entire length of the rod be exposed for a significant period of time. Thus so far, the worst case appears to have occurred has been at Unit 2, with a portion of the rods becoming uncovered when the suppression pool was damaged and operators were unable to inject coolant until pressure was relieved. Likewise, it is useful to bear in mind as well that these are only the first lines of defense from a radioactive release. Were the fuel itself to melt, it would be contained by the reactor vessel itself (made of thick steel), followed by the concrete containment. This is what is meant by "defense in depth" - several additional barriers exist to protect the public against any kind of release of materials. In the case of fuel melting, what would likely happen based on prior incidents (such as Three Mile Island) is that any melted fuel would collect at the bottom of the reactor vessel itself, where it would quickly pool out and cool. In the case of Three Mile Island, in which over half of the uranium fuel in the core melted (and over 90% of the zirconium cladding material failed), the fuel did not even penetrate the reactor vessel, much less escape primary containment. Rather, the melted fuel collected into a pool at the bottom of the vessel, quickly cooling into a lump of hot metal referred to as "corium." Given the rapid response in the case of Fukushima, it seems unlikely that damage as substantial as Three Mile Island Unit-2 occurred in these cores. 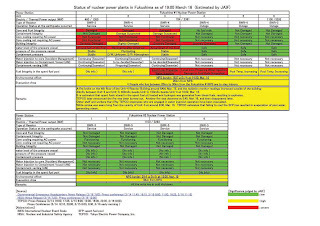 Likewise, it should be emphasized again that the radioactive release from an accident as severe as Three Mile Island was quite minimal - the average dose to the public around 10 miles from the plant was around 8 millirem (around the same as a chest X-ray), and no individual was exposed to a dose higher than 100 millirem (about one-third of a person's expected annual exposure due to natural sources). As of right now, it is difficult to determine if any fuel itself has melted in the case of Fukushima, however it is useful to draw upon examples such as Three Mile Island as an example of why much of the media panic is unwarranted. Various media sources have been jumping onto the story of radioactivity releases from the plants without putting these levels into context, stoking fears of a widespread Chernobyl-style contamination when nothing could be farther from the truth. First, there is no danger to anyone living far away from Fukushima - none. Even the risk to folks living nearby is relatively small - the levels outside the plant boundary are below the levels at which any immediate health effects could be observed. Further, the radiation levels, while above the legal limits under normal operating circumstances, pose an extremely small risk themselves - the best advice offered by anyone thus so far in to those in the vicinity would be to roll up windows if inside and avoid going outside. Those in the immediate vicinity have already been given potassium-iodine tablets in order to "inoculate" their systems against the uptake of any radioactive iodine present (in essence, by flooding the thyroid with natural, non-radioactive iodine such that any iodine contamination present will be rapidly excreted by the body). On a more general note, one should not lose sight of the extreme devastation wrought by this earthquake and subsequent tsunami - over 6,000 people are already confirmed dead or missing, with tens of thousands now homeless or displaced by evacuation orders. Concerns about the relatively low risk from radiation releases would almost be comical were they not in stark contrast with the humanitarian crisis already present. NEI has released a side note about radiation. It suppliments well what Steve has already written so I'll provide the link here. Two units of Fukushima Daiini have now achieved cold shutdown with full cooling capabilities. They are currently working on the third. This is the equivalent to the train coming to a stop from full speed. Kudos to TEPCO, not that it would or should be any another way and may the rest of the units follow soon. The U.S. Nuclear Regulatory Commission reports that the Japanese government has formally asked for assistance from the United States on nuclear power plant cooling issues triggered by the March 11 tsunami. The agency has already sent two experts on boiling water reactor issues to Japan as part of a U.S. Agency for International Development disaster relief team. The experts now are in Tokyo providing technical assistance. The U.S. NRC is also monitoring the Japanese reactor events around the clock from its headquarters operations center in Rockville, Md. The utility said a hydrogen explosion at the nearby No. 3 reactor that occurred Monday morning may have caused a glitch in the cooling system of the No. 2 reactor. The hydrogen explosion at reactor 3 on March 14 injured 11 people: seven TEPCO workers at the site and four members of the country’s Self-Defense Forces. The reactor's containment vessel was not damaged and the reactor remains safely contained in its primary containment. I had completely forgotten about the schematic repository from the University of New Mexico! TheEngineer, thanks for the reminder. I link you to his recent post with gives a link to a very nice diagram of a very similar designed BWR at Oyster Creek. I keep meaning to print some of these schematics and hang them around the cube. - Reactor is shut down and reactor water level is stable. - Offsite power is available. - Injection of water into the reactor is done by Make-up Water Condensate System. - We do not believe there is leakage of reactor coolant in the containment vessel. - At 5:32am, Mar 12th, the temperature of the suppression chamber exceeded 100 degrees. As the reactor pressure suppression function was lost, at 5:32am, Mar 12th, it was determined that a specific incident stipulated in article 15, clause 1 has occurred. - We decided to prepare implementing measures to reduce the pressure of the reactor containment vessel (partial discharge of air containing radioactive materials) in order to fully secure safety. This preparation work started at around 10:33am, Mar 12th and finished at 10:58pm, Mar 12th. - Restoration work in reactor cooling function is in progress to achieve reactor cold shutdown. - Restoration work in reactor cooling function that was conducted to achieve reactor cold shutdown has been completed and cooling of the reactor has been commenced at 7:13 am, Mar 14th. At approximately 11:01am, an explosion followed by white smoke occurred at the reactor building of Unit 3. It was believed to be a hydrogen explosion. As of 1:30 pm, 4 TEPCO employees and 3 workers from other companies have sustained injuries (all of them are conscious). 3 ambulances are in operation to care for them and 2 have already dispatched the casualties to the hospital. As of 0:30 pm, the measured value of radiation dose near MP6 was 4μSv/h. The increase of the radiation dose cannot be confirmed at this time. As of 0:30 pm, the measured value of radiation dose at the monitoring post in Fukushima Daini Power Station located approximately 10 km south of Fukushima Daiichi Power Station remains at the same level. In light of the incidents that have occurred at Units 1 and 3, we are considering applying prevention measures to the wall of the reactor building to ventilate the hydrogen gas contained in Unit 2. TEPCO continues to take all measures to restore the safety and security of the site and are monitoring the site's immediate surroundings. So unit 2 has had cooling restored. Also, they are discussing modifying the secondary containment structure of unit 2's reactor building so that there cannot be any buildup of hydrogen gas from the venting process of primary containment. This work by The Neutron Economy is licensed under a Creative Commons Attribution-ShareAlike 3.0 Unported License. 14 everyday helpful uses of...nuclear waste? !